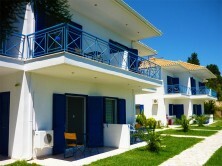 Nymphs rooms and apartments located to the beautiful Lefkas among the villages Nikiana-Nydri, their location makes them ideal for quiet and relaxing summer vacations. Our unit comprised by eight studios and four apartments with beautiful view to the sea and preferred by couples and families. The distance of the closest beach is only 200m. from our rooms and you can reach the villages Nikiana-Nydri on less than five minutes. We can promise you that your holidays at rooms Nymphs will be unforgettable. The location is ideal for excursions, the nearest beach distance is 200m, the largest only 40 minutes and the most cosmopolitan village on the island five minutes by car. All rooms have magnificent sea view and is fully equipped to meet your every need. Our rooms offer air-condition, TV, bathroom, kitchenette, refrigerator, balcony with magnificent sea view, ample parking and free wireless internet. Anything you need can be obtained from Nikiana which is the nearest village and away from rooms 3 minutes.